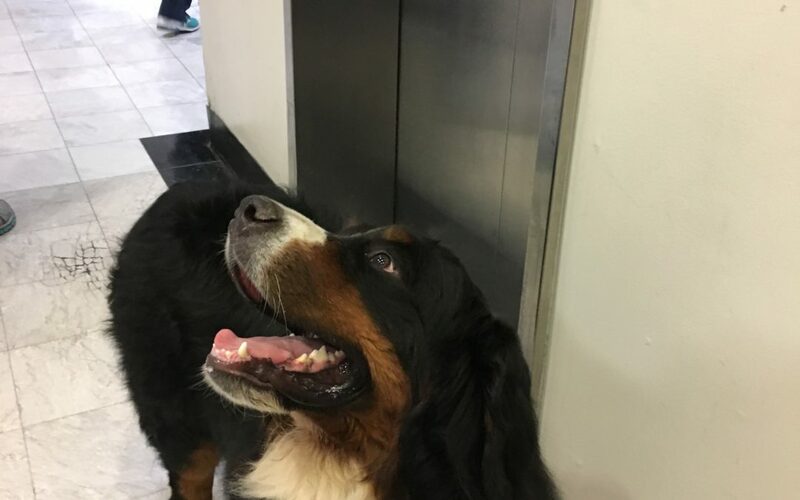 After seven months in his volunteer job as a therapy dog at MUSC Hospital, Marcel loves riding in elevators. Given a choice (and yes, I intentionally ask him to choose between taking the stairs and riding the elevator and you’ll soon understand why), Marcel almost always pulls me toward the elevator. So why is two-and-a-half year old Marcel so enthusiastic about elevators? He can’t answer, but it’s related to the field of behavior design—helping people (and dogs) do something that they consider agreeable, and even desirable. Marcel consistently experiences an enjoyable elevator ride, which makes him willing to do it again and again. Social – Once he enters, he usually encounters friendly people who shower him with attention, including ear rubs. 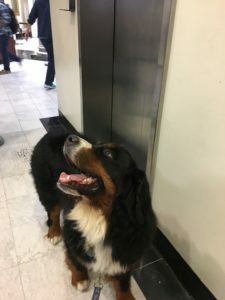 Playful – While we wait at the elevator bank, Marcel and I play a game: “Which elevator will arrive next?” Marcel almost always wins because his superior sense of smell and hearing give him a competitive edge. You can use these design elements too when you’re motivating people to take action. Take time upfront to figure out how to position the behavior as voluntary, social and playful. Here’s why and how each of these three elements work so well. 1.Voluntary. Humans—and dogs too—like having autonomy. We want a sense of freedom or control over how we do things. To fulfill this need, give people options rather than forcing them to comply. For example, make training optional rather than mandatory. And make it a worthwhile, memorable experience so those who go will give it rave reviews and encourage others to attend future sessions. In a recent webinar, Dr. David Rock, Director of the NeuroLeadership Institute, shared that companies with well-designed performance management training are typically getting about 80% of managers to participate. Even better, the managers who attend give the training high ratings, follow directions, and tell colleagues about their good experiences. 2.Social. We humans are social creatures. We gravitate toward participating in events and experiences that involve others, especially if we have time to interact in an enjoyable and meaningful way. For example, we often recall an event based on who experienced it with us. And the intensity of our memory is often linked to the emotional connections with made with others rather than the event itself. So the next time you are developing the agenda for a meeting in which you’re going to share important content that you want people to remember and act on, think about how you’ll help meeting participants connect with each other. And be sure to provide food and beverages too. 3.Playful. “Fun” and “play” traditionally are words not associated with work. However, we benefit from lightening up, smiling and laughing together, wherever we are. Laughing together helps us do new tasks, especially if we can chuckle over our awkwardness in experimenting with a new behavior. Laughter also helps us be more creative. When you break actions into easy-to-follow steps, you increase your chances that people will comply. For example, if you want feedback through an online survey, make sure it’s a one-click action. And be sure to recognize and reward others for taking actions. With National Talk in an Elevator Day (#TalkInAnElevatorDay) coming up on Friday, July 27, which will be an MUSC volunteer day for us, I’m not sure how we’ll celebrate. Any ideas? Meanwhile, good luck figuring out the best buttons to push to motivate others to act! And if you need any help, just contact me.